One of my favorite players in the Big Sky to watch is Durrell Norman of Northern Arizona. He is not the most talented player in the conference, and he is not necessarily the most exciting, but he is a guy that does whatever the team needs for him to win. In theory, he is a 6'4'', 190 pound guard. 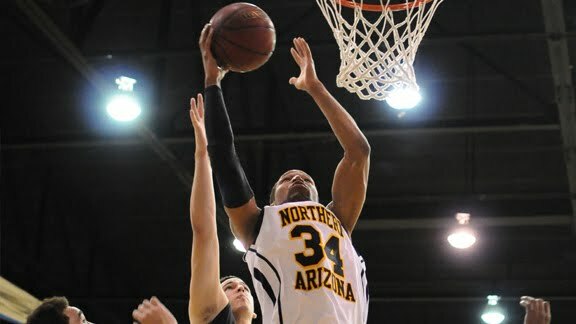 In actuality for NAU, he is their best inside player. On a team that is very thin in the frontcourt, he is a guy that you constantly find battling down low for the Lumberjacks. Despite his size, he is leading the team in rebounding by a wide margin this year, with 6.8 per game. He is also third in scoring at 9.3 points per game. He has very good rebounding rates, with an OR% of 12.2 (149th in the country), and a DR% of 18.8 (260th in the country). He is a moderately efficient scorer, as he shoots over 50% from 2s (but he is 0/9 from beyond the arc), and is solid at getting to the line (though he only shoots 64% FT). Despite battling guys bigger than him, he is a solid offensive player. Norman is not the biggest guy in the conference, and he is not the most talented, but he does whatever his team needs to win. For that, he is a guy I love to follow in the Big Sky.